Much has been written about the Grundig Satellit 700 since its introduction in 1991. Succinctly put, it's a world-class digital receiver. This is the radio I use for all my serious shortwave listening. It tunes 150-353 kHz (LW), 528-1611 kHz (MW), 1612-30000 kHz (SW), and 87.5-108 MHz (FM). It decodes SSB, which makes it suitable for listening to hams, utility stations, and the shortwave broadcasters that use SSB. The '700's sensitivity and selectivity are excellent. The digital display has two separate clock/timers, a signal strength meter, band indicator, frequency readout, and user-definable eight-character "name" for each memorized station, so when you put a station in memory, you can "name it" (e.g. "DW D" in the photo). It also has circuitry on FM to decode RDS broadcast information where available. The memory on this radio is another feature that makes it special. It is shipped 512 available memory locations, and if you purchase the extra memory chips (which I did) you can upgrade to 2048 memory locations. If you follow this link, you can learn more about the memory chips (courtesy of the Grundig Radio Boy web site). True to the Grundig tradition, the audio on this radio is excellent, and includes separate treble and bass controls. Stereo reception is delivered through headphones or external speakers. Jacks providing line-level out (left and right), input for an external antenna, and 12 VDC-in are included. Another nice feature is the built-in battery charger: I originally loaded the unit up with four Sanyo rechargeables (KR-4400D), and as long as it's plugged in the cells are under a charge, so it was always ready. Built at Grundig's factory in Portugal, the Satellit 700 is extremely rugged, although a few years ago the antenna flopped over at an inopportune time, and I had to replace it. There was also that time my daughter, who was 2 at the time, stepped on the dust cover (not shown here) and cracked it in half. Getting parts has always been a bit difficult, since they need to come from Germany, but over recent years they've been getting even tougher to find. A source like Universal Radio is good to know about. 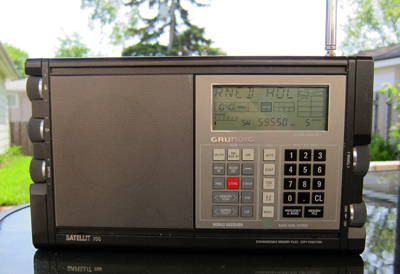 Grundig introduced this radio in 1991, and it was a popular seller throughout the SWL community for a number of years. I bought mine in early 1993 when the price dropped to a more "reasonable" level. The '700 reached the closeout market (sold by sources like Damark) around 1996, and since then when they've popped up on sites like eBay they get snapped up very quickly. A great piece of equipment. If you find one, seriously consider adding it to your collection!